I know. It’s a lame and predictable heading for a blog post, but the evening at Taste was simply divine. I met two friends for a spontaneous dinner a while ago (full disclosure: it was December), and we absolutely raved about the evening. We all ordered the prix fixe menu, which features three courses and two glasses of wine (by the glass) for $49. You select an appetizer and an entrée and a dessert from the menu (the choices all sounded so good that it was really to choose!). When you add up the prices individually, the prix fixe menu is an absolute bargain. I’m not a big drinker and I wasn’t in the mood for two glasses of wine that night, so I gave one of my dinner companions my second glass. 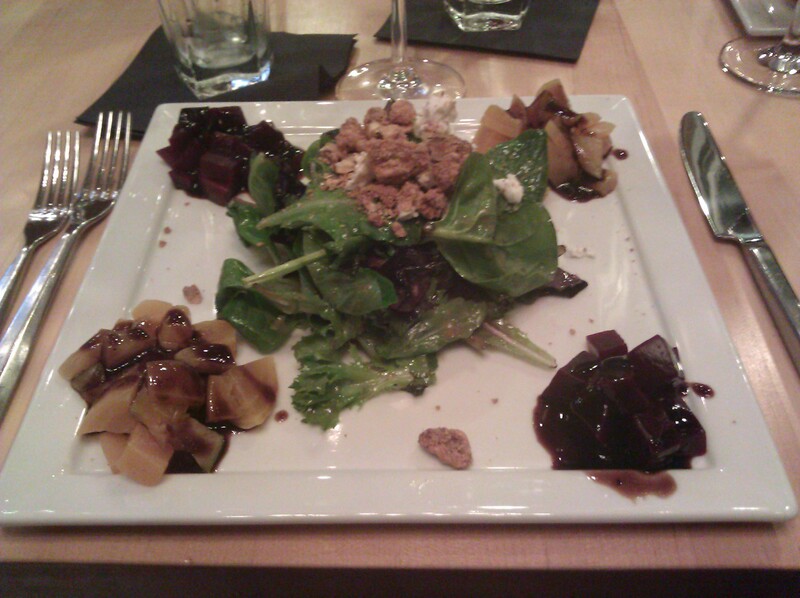 I started with the beet salad, which featured roasted red and golden beets accompanied with a salad featuring goat cheese, candied walnuts, sweet balsamic drizzle. I’ve always loved cold beets (my father loves them so I grew up eating them), but even if I didn’t I would be a fan after eating this salad. I loved the pairing of the beets with the sweet balsamic drizzle. The balsamic really complemented the beets. The salad was also tasty, which I attribute to the candied walnuts. I’m a sucker for goat cheese as well, so I couldn’t have been more pleased with my salad. 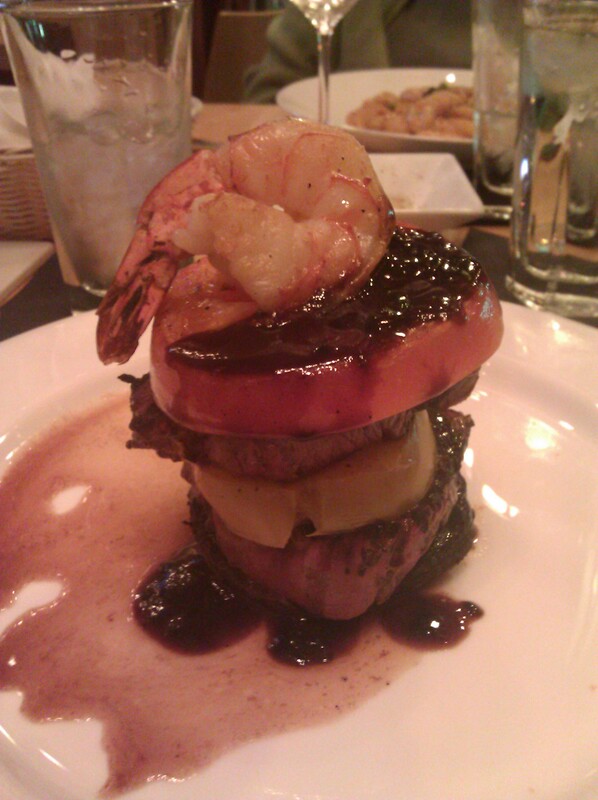 My second course was a stacked surf & turf entree featuring filet mignon, a portabello mushroom, a tomato slice, and a shrimp with a sherry wine basil sauce. It was a thing to behold – just look at it! As for the taste, well I think I may have actually moaned at the first bite. The filet was perfectly cooked, and the vegetables were tender and not overcooked. 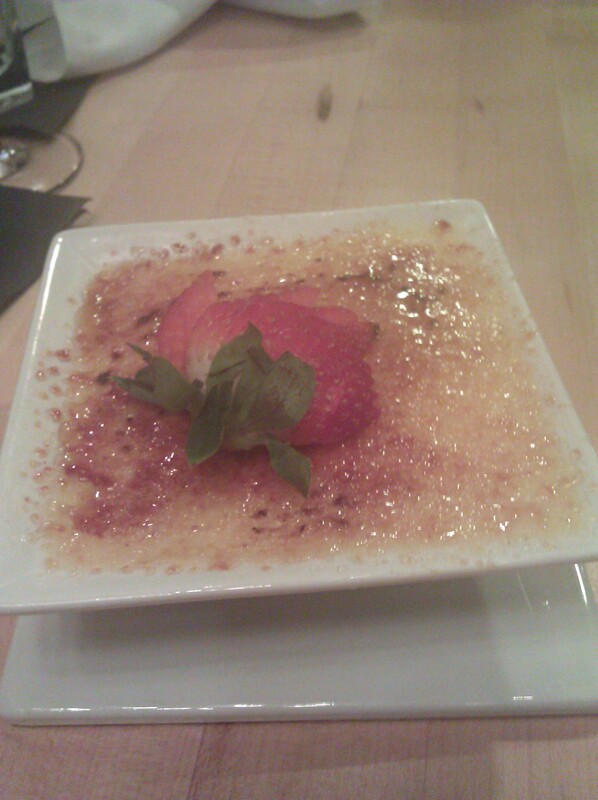 When it came to the dessert I had a very tough time deciding what to order. 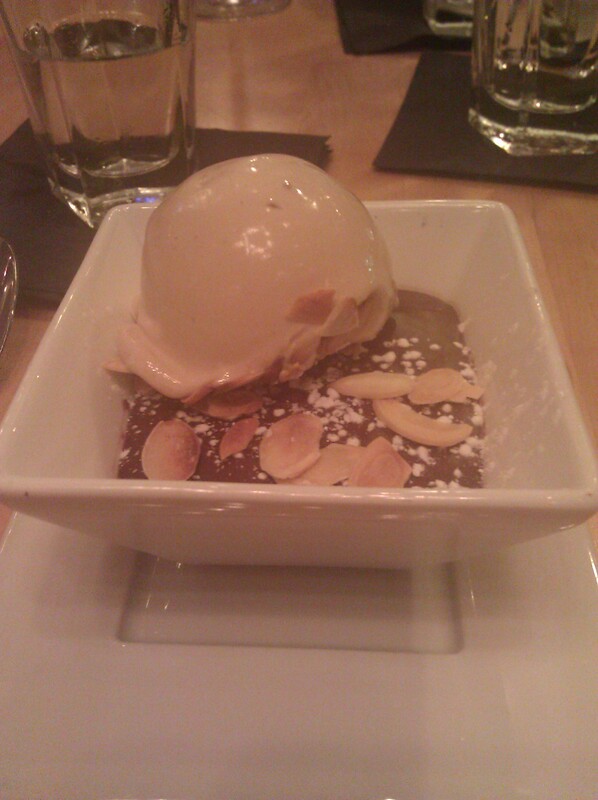 My friend and I decided to order two different desserts and share them – a chocolate mousse with hazelnut ice cream and a white chocolate and vanilla crème brulee. Both were exceptional and I would be very hard pressed to choose my favorite. It was the perfect amount of food – not too much and not too little. I also have to say that the service was impeccable from start to finish. We had a lovely table by the window, were quickly greeted by our waitress, and were even visited by either the manager or the owner at some point during our meal. And when I knocked over my ice water they were Johnny on the Spot with extra napkins to wipe away the ice and water (I never claimed to be graceful). We all left very happy campers. The prix fixe is a decent deal there. When we went, we were tempted but then decided to just order off the menu. In hindsight, I felt that the prices were high for what we got. Also, it was a much older crowd that night. What was it like when you were there? It was one of the super snowy days in December, so the restaurant was actually pretty empty. We went there because I had cancelled a dining out event that night due to the snow. Taste was close to all three of us, so we went there. That said, one of my fellow diners is older (mid 60s). He has become a foodie over the past few years through my tutelage. He never used to care, but now enjoys a good meal very much. I don’t seem to remember noticing that it was an older crowd. I’m fairly certain there were a few younger tables there.